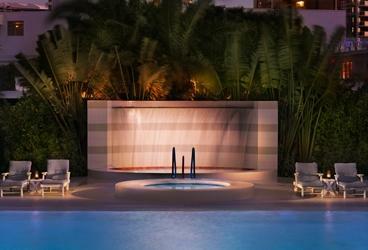 The spa playground inside The Standard Miami is hands-down one of the top spa experiences I have ever been to. 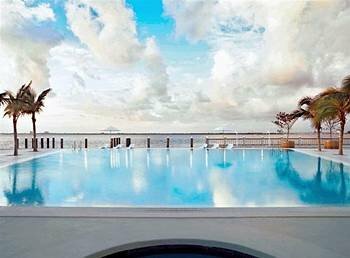 Just a short cab ride from the heart of South Beach, sits The old Lido Spa Hotel. 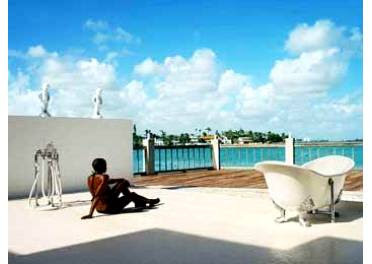 It has been converted into a hip bayside paradise full of retro whimsy by hotelier Andre Balazs . The sign for the original hotel still exists and it is only upon closer examination that you will see the name, 'The Standard' spelled upside-down above the entrance. 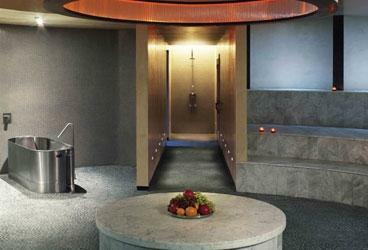 First stop is The Hamam (left), a warm marble room where you can stretch, lounge and warm up. It's also a great place to meditate. A Quickie Massage - Book yourself in with Fazli Othman, a massage therapist originally from Malaysia with a lovely and friendly personality. He will work magic on your back. Fazli will deep-tissue you into melted butter. $105 for 45 minutes and includes spa access, which is a great deal. The Hamam Bath - After a massage, take a soak in one of the four metal soaking tubs located inside the hamam. Oils and bath salts are available for purchase at the spa shop. DIY Scrub - You can even purchase a scrub and give yourself or have a friend scrub you down in the scrub room. Say buh-bye to all those dead skin cells and all that caked on sunscreen. Each scrub room is equipped with a shower spray to rinse off. Steam and Sauna Rooms - Hit them both for a detox with a cold water rinse under one of the rainfall shower heads or in the sound shower, surrounded by nature sounds. Get outside and hit the hydrotherapy circuit! Falling Waterfall Column - Prepare to have all remaining tension in your neck, shoulders and back relieved from a 12 foot high column of falling water. Roman Waterfall Hot Tub - Soak it all out in a 103 degree hot tub with an eight foot cascade of water on your shoulders. Then plunge into their Arctic Pool to cool off. Warm up again in one of the sun loungers around the Infinity Pool or go for a swim. Rinse and repeat. We also found a lot of nooks to just chill, including a set of swing chairs in the Shady Swing Lounge or around a fire pit in the Garden Fire Lounge. The outdoor DIY Mud Lounge (above) was the treatment I was looking forward to the most! For $20, you can buy a big cup of golden mud full of nutrients that is imported from France. Take the mud and spread it all over your body and then sit in one of their sun loungers and bake it off in the hot Florida sun. After about 15 minutes or so, flake off what you can and soak in one of their outdoor tubs for a muddy mineral bath. Your skin will be glowing and look amazing. 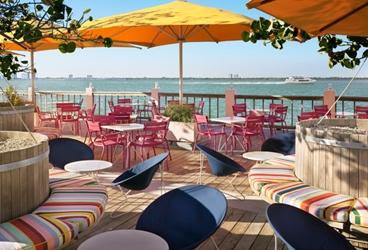 After soaking up the sun and treating your body well, make sure to grab lunch or snack at The Bayside Grill (left) with a huge patio overlooking Biscayne Bay. The menu features healthy salads, sandwiches, smoothies and vegan options. If you're visiting on a Sunday, make sure you stay to play Bingo! The prizes are actually really good and include spa treatments and other goodies that don't conclude with you winning a paddle ball. The Standard Spa literally blew me away and I know it's a place I will want to visit every year, especially during the long and cold winters of Toronto. Room rates drop significantly in the summer, so it could be a good time go.